Zombie Vikings is a beat'm up similar to what you'll find in Castle Crashers. It features a fast paced combat with an interesting art style. You have your choice of 4 (6 total with the DLCs) characters, and you can play upto 4 players at once locally. The characters play mostly the same, with their special attack being the aspect that separates them. You have your basic attack, when held it'll do a more powerful swing. The more you chain the more damage you'll do. You also have a block and a roll as defensive maneuvers, and of course you have your jump and jump attack as well. To help round things out, there is also a throw key, that allows you to carry and throw a variety of things, your allies, objects and enemies. The most interesting attack is the special key that each character's signature move. Like the regular attack, it has a quick press, and a hold variation. Each character's special varies quite a lot, from throwing groups of enemies, to a scorpion like arm harpoon that helps you continue your combo. The game plays very similar to the likes of Castle Crashers. You and possibly a group of your local friends will head out, button mashing and comboing your way through any give map. Throughout you'll encounter a variety of different enemies and boss battles. Most of the combat plays out as you expect from any given beat'm ups. Zombie Viking's combat does feel smooth, responsive, and quick, but it don't really do anything to move the genre forward, but it at least feels good. Because of the variety in maneuvers available, the game does feature some depth in mechanics to learn, however it's also not the hardest beat'm up I've ever played. The art style and overall presentation of Zombie Vikings is superb. It features an interesting digital paint look, that's whimsical as it is comedic. The sound track, voice acting, and story also reflect this. As far as presentations are concerned, I don't have much to complain about. 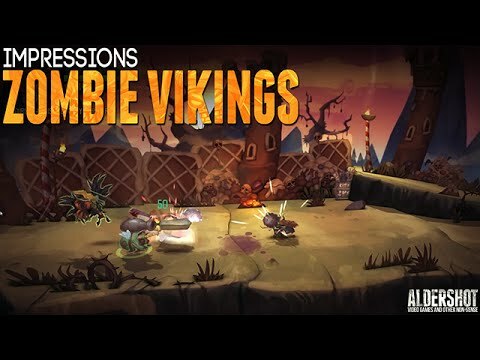 Overall Zombie Vikings doesn't do much in the way of moving the genre of beat'm ups forward, but what it does do it does competently, and is overall an enjoyable experience.